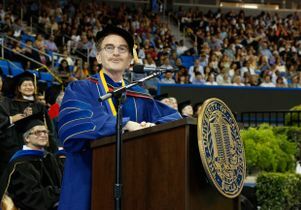 As beaming UCLA graduates clutched red roses and wore magenta orchid leis, Randy Schekman, the UCLA alumnus who received the 2013 Nobel Prize in physiology or medicine, reminded them that a public university is the most effective engine of social mobility. Schekman, the son of middle class parents who encouraged him to go to college but had limited means to pay for it, said most students in the U.S. attend public institutions where family income is much closer to the national average. “The real world comes to UCLA," he said. The UC Berkeley professor of molecular and cell biology was the keynote speaker at the UCLA College’s two commencement ceremonies Friday. 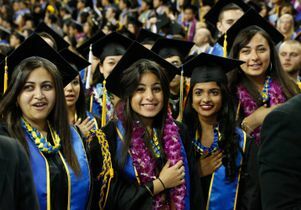 Each ceremony draws more than 10,000 graduates, family members, and friends to Pauley Pavilion. 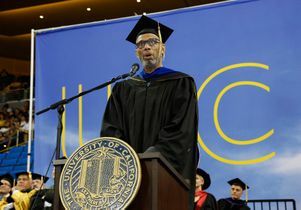 The first ceremony, held at 2 p.m., also drew a surprise guest: Kareem Abdul-Jabbar, the UCLA alumnus and basketball legend who remains the all-time leading scorer in NBA history. When Abdul-Jabbar entered Pauley with university officials, including Chancellor Gene Block and the deans of the College’s divisions, students cheered and snapped photos as he walked by. Along with Block, Abdul-Jabbar presented Schekman with the UCLA Medal, the university's highest honor, for his “life-changing breakthroughs in the field of cell biology” and other contributions. 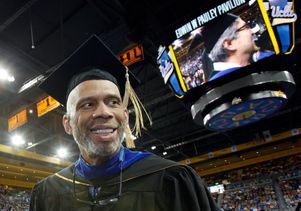 Like Schekman, Abdul-Jabbar reminded graduates why a UCLA education is so unique and valuable. 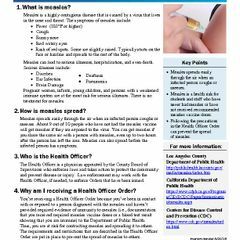 UCLA, he said, gives students the tools to leave their mark in life, adding that Schekman and he did “OK” in that department. “Once you’ve accomplished those personal goals, you start to wonder what goals you could accomplish for the rest of the world, how you can live humbly for a noble cause,” he said. 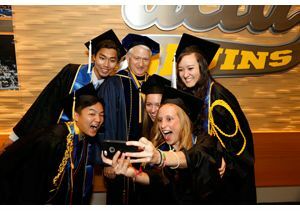 ► More Commencement 2014 stories and photos. Schekman has done this by researching “stuff that most of us can’t understand or pronounce,” and Abdul-Jabbar by writing history books, he said. And he lauded Schekman for doing “something brave and admirable.” Last year, Schekman announced that his lab at UC Berkeley would no longer submit articles to some of the world’s most prestigious science journals, saying that he believes the journals’ closed access policy harms the pursuit of legitimate scientific goals and compromises research. ”Dr. Schekman didn’t have to do this," Abdul-Jabbar said. "He could have stayed in his lab polishing his Nobel Prize, wishing it was an NBA championship trophy. But he didn’t and took on the scientific establishment because he believes there’s a better way." Just as Schekman has championed more open access to journals, he’s also advocated for the state government to increase financial support for public higher education because of the opportunities provided to people who otherwise wouldn’t have the means to attend college. 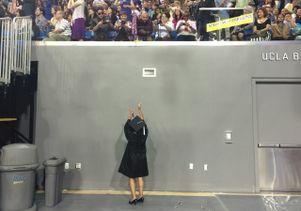 He asked graduates who were first-generation college students to stand and receive applause. “Rich private universities that cater to privilege and pedigree don’t hold a candle to what you have accomplished to reach this milestone,” he said. “We owe it to our families, to our younger brothers and sisters, to our children and grandchildren to reverse this trend so that members of future generations will have access to the same outstanding UC education that you and I have enjoyed,” he said. Kareem Abdul-Jabbar, Randy Schekman and Chancellor Gene Block at UCLA College commencement 2014. 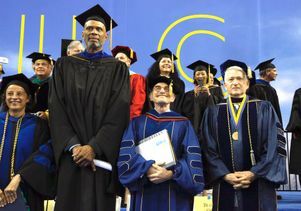 Kareem Abdul-Jabbar at UCLA Commencement 2014. Singing the national anthem at UCLA College commencement 2014. Kareem Abdul-Jabbar marches into Pauley Pavilion. 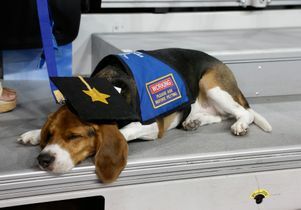 Working dog at UCLA College graduation. Commencement 2014. 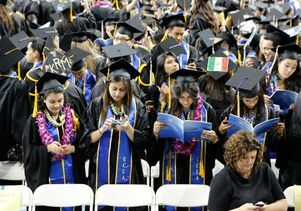 Commencement 2014 in Pauley Pavilion.